The Solicitor General showed keen interest in the significant contribution made by City Law School students to members of the public for whom legal aid is unavailable. 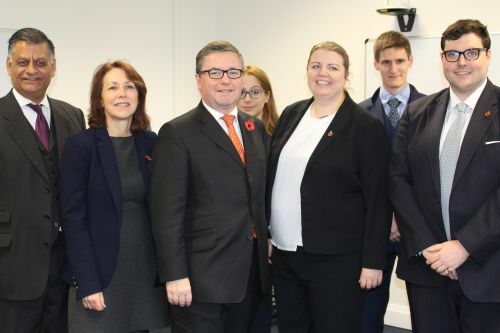 On 10th November 2017, the City Law School welcomed Solicitor General (SG) for England & Wales, Robert Buckland QC MP, to Gray's Inn Place. The SG's visit was part of a fact-finding visit to gather more information about Pro Bono activities that City Law School students are exposed to during their studies. The SG was particularly interested in two projects: the domestic abuse/violence subject module available to students, where they obtain emergency injunctive relief on behalf of victims before the courts; and, the Centre for Criminal Appeals, in which student volunteers assist with submitting grounds for cases, which then go on to be lodged before either the Court of Appeal or the Criminal Cases Review Commission. Many students receive intensive specific legal training and then assist prisoners and litigants in person. During his visit, the SG spoke to the subject leader for the module, Ronnie Lachkovic, the Director of the Centre for Criminal Appeals, Suzanne Gower, and ex-students who had worked on the programmes. It was an extremely productive meeting. We had an excellent opportunity to engage with one of the most senior legal and political figures in the UK government who is examining the provision of legal education in this country. It was a great opportunity for the City Law School to showcase its wide range of pro bono work and highlight the far from insignificant contribution made by its students to members of the public, for whom legal aid is unavailable and who have few other sources and support to turn to. We are extremely proud of the commitment shown by our students to pro bono work and working with community organisations.